I just finished my March running “hat trick” – three half marathons in three weeks. I probably should still be recovering from February’s marathon but I could not pass up these races. I have another “hat trick” in April/May. After that, I will be back to training for the Berlin Marathon, again. Hopefully, this time my training will be uneventful and I will be able to run through the Brandenburg Gates on September 27 as planned. I know I will be doing everything to ensure that I can. 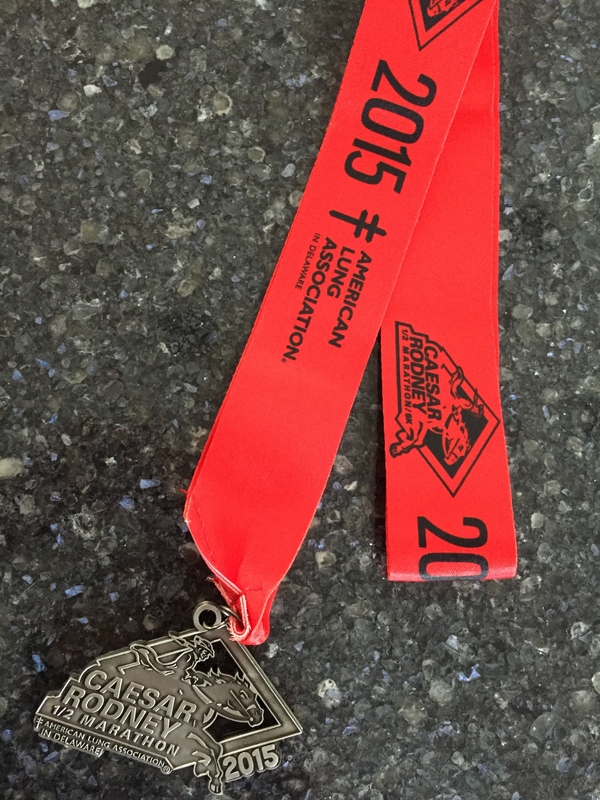 This weekend I ran the 52nd Caesar Rodney Half Marathon in Wilmington, Delaware. The race benefits the American Lung Association. I wondered who Caesar Rodney was because it seemed like everything in the area was named for Caesar Rodney – schools, public buildings, and the square in Wilmington where the race started and finished. There is even a Caesar Rodney Institute. I thought maybe he was a famous politician or philantrophist who died from some lung disease, maybe from years of smoking. Turns out Mr. Rodney was an officer in the American Revolutionary War, signed the Declaration of Independence, and held a number of political offices between 1755 and 1784. Mr. Rodney appears on the 1999 Delaware State Quarter on horseback, commemorating his historic 70-mile ride on July 1, 1776, through a thunderstorm, to Philadelphia to vote for the resolution of independence. He arrived on July 2nd, just as the historic vote began. I guess having people run a half marathon is an appropriate way to remember Mr. Rodney’s ride. The race medal even depicts him on horseback. The Caesar Rodney Half Marathon was a small race – only 830 runners. (I saw one woman running the race wearing a strand of pearls with matching pearl earrings. That was a first!) The race course was not an easy one. The course started off down hill and then along a river where it was flat. Then around Mile 5.5 we started a steady uphill climb to Mile 9. At the top, spectators and volunteers kept yelling that it was downhill from there. Yes, it was – until you turned the last corner and saw that it was straight up hill to the finish. I couldn’t even see the finish line from the bottom of the hill. Despite a course that was much more challenging than last weekend’s New York City Half Marathon, my time was better and I even had negative splits (meaning my per mile pace at the end of the race was faster than it was in the first half). I was happy. I can see why people come back every year to run this one. The organizers of this race claim that it is the oldest continuously running half marathon in the United States. During the race, I passed two older gentlemen runners; they looked like they were in their early 70s. They obviously were close friends and warned me that it was against the rules to run between them. We had a good laugh over that. One of them told me that this was his 30th time running this race. When you think about it, that is a pretty incredible accomplishment. These two gentlemen prove that age should not stop you from getting out there and doing what you can. I recently read about British sprinter Charles Eugstar. Charles wants to change people’s thinking about old age. He wants to make old age the best part of life and show that you can learn something new no matter what age you are. Charles leads by example. He started body building at age 87. He admits part of it was vanity – he wanted to improve his appearance. Charles even used a previous Mr. Universe as his personal trainer. Then he decided that he wanted to take up running, or more specifically sprinting (running short distances as fast as possible). Eight years later, Charles set the world record for runners over 95 years old in the 200-meter dash. He completed it in 55.48 seconds, more than two seconds faster than the previous record. Reading about Charles made me think about a British study that was recently published in the Journal of the American Medical Association (JAMA) Internal Medicine. The study by Isla Rippon and Andrew Steptoe at University College London of 6,500 adults – average age 66 years – indicated that how old people felt was an indicator of their mortality. At the start of the study, the researchers asked the participants how old they felt. Many felt younger than their actual chronological age. The researchers then followed the participants over the next eight years. The people who felt younger than their chronological age at the start of the study fared better and had the lowest chance of dying (14% had died). The people who felt their actual age or older than their actual age at the start of the study had the greatest chance of dying (19% and 25% respectively died during the study). The researchers made adjustments to the data to exclude people who died in the first year (i.e., people who were already dying). They also took into account things like illnesses, smoking, alcohol consumption, physical activity, education and wealth. With all these adjustments, the link between how old the study participant felt and mortality remained. Although more study is needed to explain why feeling old may predict death, it is interesting to think about. Obviously Charles doesn’t feel his 95 years and I doubt that the two gentlemen running the Caesar Rodney Half Marathon feel their age either. They were motoring up those hills with much younger runners behind them. Watching people like them and Charles is inspiring. Maybe old age really is a state of mind! Here is an interesting interview with Charles. He is a real hoot!